Having apprised regular readers of certain facts about an upcoming Wodehouse exhibition at the British Library, the keen observer may have detected an absence of new material here at Plumtopia. But the world of Wodehouse has not suffered. Indeed, it has been buzzing along quite nicely. On 11 October, the P G Wodehouse Society (UK) held its biennial dinner. This is always a special occasion, and in 2018 included readings from Neil Pearson, Katy Reece, and Robert Daws. Daws is well known to Wodehouse fans for playing Tuppy Glossop in the Jeeves and Wooster television series. He also gave a performed reading of ‘Wodehouse in Wonderland’ — a play by William Humble — at the recent Blenheim Palace Festival of Literature Film & Music. The biggest news item of the year was also announced at the dinner. The momentous news — that a memorial stone for Wodehouse is planned for Westminster Abbey — has been widely reported (see Patrick Kidd in The Times, Alison Flood in The Guardian). The Empress of Japan recently announced that she will spend her upcoming retirement reading as much as possible – and P.G. Wodehouse’s Jeeves and Wooster books are at the top of her reading pile. This has sparked a rise in demand for Wodehouse’s work in Japan – with sales increasing from around 100 books per anum to 100 per day, according to publishers. Hopefully this will lead to renewed demand for Wodehouse translator Tamaki Morimura to translate more of Wodehouse’s work. What makes this new Wodehouse homage by Ben Schott different from all the other Wodehouse homages that have been written over the years? Well, like Sebastian Faulks’ ‘Jeeves and the Wedding Bells’, this one has been blessed with the approval of the Wodehouse estate. Released in November, it has received kind reviews from Patrick Kidd (The Times) and Sophie Ratcliffe (known to Wodehouse fans as the editor of P.G. Wodehouse: A Life in Letters). Another new release of particular interest this year is ‘A Plum Assignment: Discourses on P. G. Wodehouse and His World’ by Curtis Armstrong (film and television actor) and Wodehouse expert Elliott Milstein. The British Library’s Wodehouse exhibition opened in November and will continue through to February 2019. They’ve also hosted several Wodehouse related events, with the next one planned for 21 February 2019 — an evening of Wodehouse stories and song, including Wodehouse biographer Robert McCrum. Tickets for the previous event sold out, so don’t wait too long for this one (tickets here). Wodehouse fans in the USA will finally be able to enjoy the delights of Perfect Nonsense, the Goodale brothers’ delightful stage adaptation of The Code of the Woosters. Its first US performance will run March 21 to April 14 2019 in Hartford, Connecticut (tickets here). Personal demands (wheels within wheels) over the last few months have made it difficult to write at length, but you can find me on Twitter @HonoriaPlum for a daily dose of Wodehouse, including any Wodehouse news that comes to hand. I have grand plans for Plumtopia in 2019, and trust this brief absence has not caused any significant loss to the world of blogging, Wodehouse, or indeed literature. There was once a millionaire who, having devoted a long life to an unceasing struggle to amass his millions, looked up from his death-bed and said plaintively, ‘And now, perhaps, someone will kindly tell me what’s it’s all been about.’ I get that feeling sometimes, looking back. Couldn’t I, I ask myself, have skipped one or two of those works of mine and gone off and played golf without doing English literature any irreparable harm? Take, for instance, that book The Swoop, which was one of the paper-covered shilling books so prevalent around 1909. I wrote the whole 25,000 words of it in five days, and the people who read it, if placed end to end, would have reached from Hyde Park Corner to about the top of Arlington Street. Was it worth the trouble? Yes, I think so, for I had a great deal of fun writing it. I have had a great deal of fun — one-sided possibly — writing all my books. I love writing Plumtopia — thanks for reading again this year. Welcome back HP – It’s always been remarkable just how much PGW activity there is worldwide, as confirmed by your latest roundup. Now we look to you, refreshed in mind and body, to resume enlightening us with Great Thoughts in the wake of The Master. Meanwhile, we send encouraging festive greetings. Thanks so much, Murray, and best wishes of the season to you! Since last writing I have managed to find a house of my own, and look forward to having my Wodehouse books arrive from storage in the new year. I can’t wait! Go for it Mrs Plum. Can’t wait for your full-on return. Meanwhile, have a look at my latest blog piece — Another Pilgrim’s Progress. Thank you, Madame Plum, for continuing to unfold the wonders of Plumtopia! A merry and a happy to you and yours. Lovely to “see” you again! Thanks Deborah. I’d love to know what you think of it. What a relief to have you back in circulation! Season’s best wishes. This year has seen me hob nobbing with fans from India, EU and USA. Thanks so much, Ashok. I am delighted to be back, and to hear about your travels too. welcome back! The words about the fun of writing, are among the most meaningful of all 2018. Looking back to what I wrote in the past, I feel just the same (not to mention all the other good and bad feelings you experiment while writing). Merry & Happy from me too! You’re absolutely right about that. There is often a real joy and sense of satisfaction that comes from writing — especially if you feel you’ve written something good (which is lucky, because for most of us there’s no money in what we do). Thanks for the kind words and best wishes of the season to you. What ho! Just chanced upon this site. You can imagine my delight as an avid Wodehouse fan based in India – would rival that of Lord Emsworth should his Empress have won the annual show at Blandings. Are there any Wodehouse events in India? Are there any planned in the UK in early April since I’ll be visiting? Is there a newsletter one could subscribe to? Cheers and tinkerty tonk! Thanks so much for writing. I am glad you enjoyed the site. 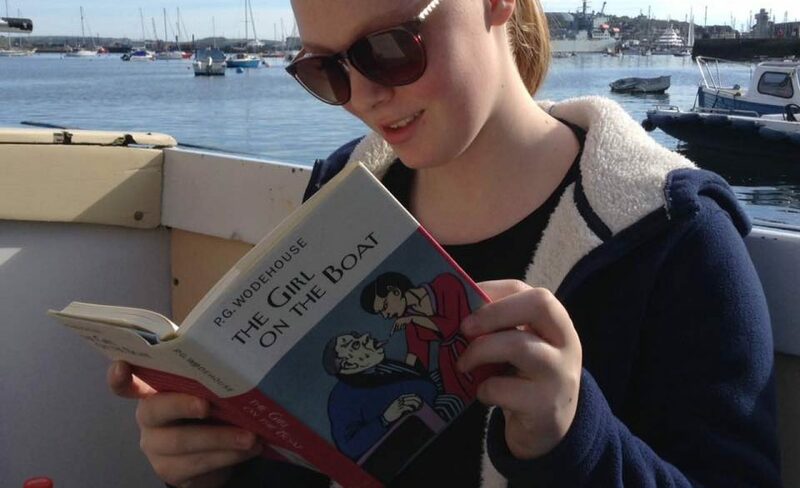 There are a few places where you can connect with other Wodehouse fans. For events in India and online discussion with fans from around the world, the ‘Fans of P G Wodehouse’ Facebook group is a great place to start. You can attend a meeting without being a member, but if you join you will also receive a quarterly journal (well worth the membership price).